Registration for the SAFE Annual Membership Meeting and Dinner on Thursday evening, July 28 at 7 PM is now available. For SAFE members, the dinner cost is just $5 with one guest for an additional $5; (additional guests after “plus one” are $25 each). The event will be held at the Wittman Regional Airport terminal building, as it was last year. A no-host social hour will begin at 6 PM. The event is sponsored by long-time SAFE supporters ASA, Sporty’s Pilot Shop, Aviation Insurance Resources, Flying Magazine and Starr Companies. Three well-known GA leaders were elected last month to the SAFE Board of Directors, each for a three-year term. They will begin their duties after the Society’s annual meeting on Thursday, July 28, 2016 at AirVenture in Oshkosh, Wisconsin. The three are Parvez Dara of New Jersey, Eric Hake of Texas, and Mike Garrison of Florida. All three men are heavily involved in aviation education and flight training with many years of general aviation experience. SAFE was founded in 2009 so that members of the aviation education profession could have a more direct voice in the way they were being represented and to raise the bar for aviation education, both in the cockpit and in the nation’s classrooms to encourage more young people to enter aviation. Parvez Dara was appointed to the SAFE Board in 2015 to complete the term of another Director who resigned. He currently serves as SAFE’s treasurer and was elected to a new three year term. He is a CFI, AGI and ATP and recently renewed his Master Instructor designation for the sixth time. Dara is a medical oncologist and has authored multiple articles on human factors, pilot error, and aviation safety. He serves as an FAA Safety Team Representative for the Philadelphia FSDO and is SAFE’s current Treasurer. Eric Hake is actively involved in aviation education on a daily basis as a trainer for The Modern Pilot LLC, a Houston, Texas based business he founded in 2015. From 2009 to 2015, Hake worked for ForeFlight, where he personally answered more than 50,000 support email messages and built up the current Pilot Support Team. Hake is also a Redbird Certificated Flight Instructor, a mission-qualified pilot in Civil Air Patrol, and a sought-after public speaker. Mike Garrison is an FAA Designated Pilot Examiner (Private through ATP), a Cirrus Factory Certified Standard Instructor Pilot and a seven time Master Certified Instructor. Garrison has been flight instructing for 40 years and for three consecutive years provided over 1,000 hours of flight instruction a year. Additionally, he is a member of numerous aviation organizations as well as a Lifetime Member of the American Society of Mechanical Engineers. Since its founding, SAFE has built a large library of audio-visual and written resource materials on aviation education, divided into members-only and public sections. The organization sponsors an Aviation Educator Mentoring program to help CFIs and teachers to become world-class aviation educators and offers an exclusive CFI liability insurance program. Substantial member discounts are available on many aviation books and CDs, aviation newspapers and online publications, online proficiency training, top quality headsets, flight planning services and in-flight GPS navigation. SAFE member Dr. Virginie Rollin, a professor at Embry-Riddle Aeronautical University in Daytona Beach, FL and her flying companion Dr. Nairara Petralander placed third overall in this year’s Women’s Air Race Classic. The race concluded June 24 at Daytona Beach. ERAU pilots Emmy Dillon and Abbie Pasmore placed first overall in the race. Congratulations to SAFE member Dr. Rollin and the other 100+ women who competed in the annual ARC. Classroom teachers have until August 31 to submit applications for the two $250 grants SAFE awards annually to encourage classroom teachers to incorporate aviation-themed lessons into their curriculum. One grant is awarded to a teacher in grades K-7 and the second to a teacher in grades 8-12. An individual teacher or group of teachers from the same school may apply for a grant to design an aviation-themed classroom unit or complete an aviation themed project. Applicants do not need to be SAFE members. Previous winners have used the SAFE grants to purchase remote-controlled helicopters for studying Newton’s laws of motion; test various airfoil designs, study different types of aircraft propulsion systems, and fly their designs in computer flight simulators; design and build a model rocket using a NASA engineering design process; purchase a LEGO Education WeDo Construction Set to enhance a STEM program and develop an interactive aerodynamics unit on the four forces of flight. Several industry sources and the FAA have responded to introduction of the new Airman Certification Standards (ACS) with print and online guides and videos to applicants prepare for the new tests. The ASA booklets at Sporty’s are expected to be available by July 7. The FAA has the full ACS available in PDF format on its web site, for both Private Pilot- Airplane Airman Certification Standards and Instrument Rating – Airplane Airman Certification Standards. Both may be downloaded for free. “You go preflight; I’ll be right out.” Blogger and New York DPE David St. George asks if you keep FAR 91.103 in mind when telling a student to prepare for a lesson. It’s required, you know. Blogger and 9,000+ hour CFI Michael Phillips admits to two experiences in the last year that were painful reminders that maintaining a high standard of excellence is an ongoing process for all CFIs. What might be called “defective Instrument Proficiency Checks” (IPC) have contributed to accidents investigated by SAFE member Jeff Edwards. Knowing that, is the FAA proposal to lower requirements for maintaining IFR currency a good thing? SAFE Board Member David St. George, in a blog entry called Friends Don’t Let Friends Fly Stupid!, suggests that taking action when seeing another pilot prepare to do something unsafe is a good thing. 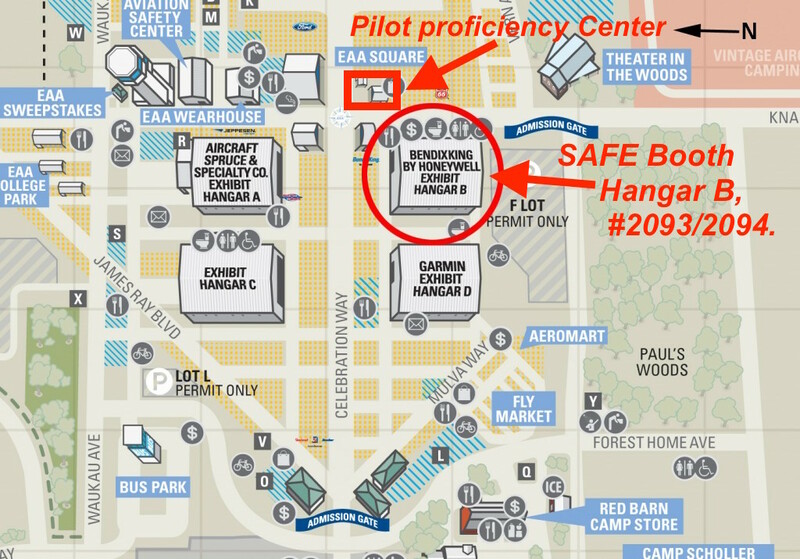 The EAA Pilot Proficiency Center has moved to the ‘EAA Four Corners’ on the AirVenture 2016 grounds, along Celebration Way and Knapp Street. The Center will be open from Monday through Saturday, July 25-30, and is open to any pilot who wants to improve his or her knowledge or skill in aviation. The daily schedule includes a full lineup of Tech Talks by expert instructors on topics including crosswind landings, situational awareness, tailwheel tips and tricks, and charts. All Tech Talks are eligible for FAA WINGS pilot proficiency program credit. The Center will have 12 Redbird LD flight simulators for both IFR and VFR proficiency, as well as a Redbird MCX and Crosswind simulator. Partners for the 2016 EAA Pilot Proficiency Center include SAFE, NAFI, Hartzell Propeller Inc., Jeppesen, Redbird Flight, AOPA, David Clark, Mindstar Aviation, PilotEdge and Plane & Pilot Magazine. An extensive revision of FAA aviation training handbooks has been underway for several years and last week SAFE received the latest updates to the publication schedule from the FAA. The updates to the 8083 Handbook Series ensures that the material is current, incorporate errata and align the documents with the new Airman Certification Standards (ACS). The latest revisions of all 8083 Handbooks, including addendums, errata, and change pages are available at FAA sites Aviation Handbooks & Manuals and Aircraft Handbooks & Manuals. The new revisions, when released, will be available for free download from these sites. SAFE, through its participation on the ACS Working Group, as well as SAFE member Rich Stowell, provided significant input for the revisions. Two of the top names in the aviation training world – John King of King Schools and well-known aviation educator and humorist Rod Machado, both SAFE members – engaged in a ‘dogfight’ in the July 2016 issue of AOPA Pilot and FLYING Magazine, arguing for and against the FAA’s new Airman Certification Standards (ACS). John King applauds the new standards, calling them meaningful and relevant, while Machado opines that since most GA accidents are due to lack of skill rather than decision-making errors, the new ACS is not needed. provides clear information on what an applicant must know, consider, and do to qualify for an airman certificate or rating. Aligns knowledge test questions to the standards that are based on official handbooks and FAA guidance. Ensures that standards, guidance and testing all work together effectively for better safety. ACS grew out of a 2011 SAFE-sponsored summit in Atlanta, where participants complained that knowledge testing, particularly, was out of step with today’s aviation training environment. A work group tried for a Knowledge Test Standard but soon realized an overhaul of the whole airman certification system was needed and the ACS was born. The new standards are now in effect for Private Pilot and Instrument Rating applicants, and will be expanded to cover other FAA certificates and ratings as well. Several publishers and retailers now have video or text instructions for CFIs on how to cope with the new standards. A new opportunity for CFIs? An extraordinary set of FAA exemptions from more than two dozen sections of FARs 21, 43 and 61 were granted to Terrafugia, Inc., last month. This may portend a robust new market for CFIs as non-pilots buy the company’s flying car. The exemptions will allow Terrafugia to market their Transition flying car as a Light Sport Aircraft (LSA), which is expected to appeal to both pilots and non-pilots excited about the prospect of flying to an airport then driving to their destination. “The Terrafugia is an innovative aircraft that will need instructors both for initial and transition training,” said SAFE Chair Donna Wilt. “Both FAA and NASA are encouraging new products that will allow people to seamlessly go from driving to flying. A practical flying car will attract a whole new market of pilots, much like Cirrus did when it came out.” She added that current FAA rules allow an existing CFI with a commercial-pilot certificate to instruct in an LSA without restrictions. The exemptions allow the Transition a gross weight of 1,800 pounds, almost 500 pounds more than rules allow for an LSA, and an increase in stall speed from 45 knots to 54 knots. According to Terrafugia, the weight increase is mostly to allow systems that meet federal highway standards. By comparison, the gross weight of a Cessna 152 is 1,600 pounds and its stall speed is 42 knots. The company announced last year it expected customer deliveries of the Transition to start “after a couple years” at an initial price of $299,000. The FAA grant to Terrafugia gives hope to at least five other developers working on flying cars, including Aeromobil, Maverick, Krossblade, Moller Skycar and flyable motorcycle hopeful Fresh Breeze. The 2016 AOPA Flight Training poll is live. It measures the performance of flight training providers through the categories of educational quality, customer focus, community, and information sharing. The poll gathers feedback from your clients and gives you the chance to be nationally recognized in the Flight Training Excellence Awards, including coverage in Flight Training magazine and on AOPA’s website. What better way to elevate the service you provide than by seeing yourself through the eyes of your customers? With a minimum of 5 qualifying respondents, you will receive a report card summarizing customer feedback on the areas where you excel and where you can grow. It’s a powerful way to enhance the great training experience you are working hard every day to provide. The poll closes at noon on Aug. 22, 2016. Send your customers here to take the poll. Learn more about the poll and check out our promotional resource guide for flight training providers by clicking here. SAFE’s double-space booth, lit with bright flood lamps, will again be welcoming members in Exhibit Hangar B, spaces 2093 and 2094 at AirVenture 2016. Those who join SAFE, or members who renew their memberships at Air Venture qualify for excellent gifts from ASA, Gleim Publications and Sporty’s Pilot Shop, some with values in excess of SAFE’s annual membership fee. Not up for renewal? No problem! Renew at the fly-in and keep your original expiration date. ASA, Gleim and Sporty’s are longtime supporters of SAFE and go the extra mile with these bonus gifts. Please thank them for their support of our organization. Volunteers are still needed to work the booth for at least one four-hour shift during AirVenture. Volunteers will greet SAFE members, provide information on our mission, benefits and programs and welcome new members to the organization. The signup board for booth volunteers and a locator map for first-time AirVenture visitors is available on the SAFE website. One free daily admission for AirVenture 2016 is available for the volunteer day and an official SAFE shirt will be provided for volunteers who do not already have one. On-site training for booth volunteers will be provided. Organization handouts, packets for teachers to apply for SAFE’s teacher grants and other SAFE materials will be available at the booth. Among the special attractions at this year’s AirVenture are evening flying events beyond the usual Wednesday and Saturday night air shows. On Monday and Thursday evening, military biplanes and triplanes will take to the skies as part of the World War I aviation centennial celebration. Aircraft scheduled to appear will be from the collections of Old Rhinebeck Aerodrome of Rhinebeck, New York, and Golden Age Air Museum in Bethel, Pennsylvania. On Tuesday and Friday evening at the ultralight strip, attendees can get a taste of the popular Valdez STOL competition held every year in Alaska at the Valdez STOL Invitational competition. SAFE is urging members to make their views known on an FAA Notice of Proposed Rule Making that would make several significant changes in requirements for private pilot and commercial pilot applicants. The NPRM itself may be read here. Among other things, the new rule would add a fixed-gear Technically Advanced Aircraft (TAA) as one of the options for the single-engine commercial pilot training and practical test that currently requires a complex aircraft. The flight instructor practical test would be changed likewise. Allowing pilots to accomplish IFR recurrency in an FAA-approved simulator or training device without an instructor present. Reducing the frequency of IFR recency of flight experience accomplished in FAA-approved ATDs from every two months to six months, reducing the number of tasks required for such recency in ATDs and removing the three-hour flight time requirement for recurrency in ATDs. Allowing light sport airplane and gyroplane pilots to credit 10 hours of sport pilot training time toward a higher certificate for single engine airplanes and rotorcraft, and allow sport pilot flight instructors to provide training to sport pilot student on flight by reference only to instruments. To comment on the NPRM, go to the Federal Rulemaking Portal and following the online instructions for sending comments electronically. Please copy SAFE on your response to help the organization formulate an official response. The summer edition of SAFE The Magazine, the quarterly publication of the Society of Aviation and Flight Educators, was published June 19. Engine Failure X Three, a thrilling article by SAFE member and FAA Designated Pilot Examiner Larry Bothe of Indianapolis telling of his experiences with a total of nine engine failures in his 7,500+ hours as a pilot. In particular, he tells of how he experienced three of those engine failures on one checkride. To paraphrase real estate agents, “this article must be read to be believed.” Bothe has also created a webinar on the subject of how to handle suddenly-silent engines in flight. That Invaluable Instrument Rating by SAFE The Magazine editor Mark Phelps recalls a time early in his life as an instrument rated pilot when an FSS briefer provided a VFR-Not-Recommended admonition, then turned around and suggested that his proposed trip would be an ideal way to break in his new instrument ticket. “I owe a debt of gratitude to the flight briefer, and I wish I knew who he was so I could thank him,” Phelps says. In this month’s Chair’s Corner, Donna Wilt shares the history of SAFE’s K-12 Classroom Teacher Grant program, including heart-warming stories of how real-life classroom teachers have used the modest $250 grants to incorporate aviation-themed lessons into their normal curriculum. They include 2013 grant winner physics teacher Lisa Damian of Camden Hills Regional High School in Rockport, Maine, who challenged her high school juniors and seniors to research, design and build a model rocket and used the grant money to purchase the model rockets. Two professional aviation educators, both SAFE members, renewed their Master CFI designations in May. Both renewed through Master Instructors, LLC. John Urban “Rock” Rockcastle of Oxford, FL renewed his Master CFI on May 30. He is a five-time Master CFI, an Orlando FSDO FAASTeam representative and works as a simulator instructor with Simcom in Orlando, FL. He also serves on the production crew at the FAA’s National Resource Center in Lakeland. Rockcastle was the 1989 Master CFI of the Year. Of the more than 100,000 FAA-certificated CFIs in the United States, fewer than 800 are accredited as Master Instructors. The FAA approves initial or renewal of Master CFI accreditation as an alternate means for CFIs to renew their flight instructor certificates. More than 20 of recent National Flight Instructors of the Year, National FAASTeam Representatives of the Year or AMTs of the Year have been accredited Masters.